Like many, I had never heard of Jason Wu until that fateful night in November of 2008, a night where Michele Obama single-handedly put the designer on the map. But like many, I have been a fan ever since. Born in Taiwan, Jason Wu developed a penchant for fashion early on. By age 9, he started sketching and experimenting with fashion by using dolls as mannequins. He attended Parsons The New School for Design after high school but never graduated. Following an internship at Narcisco Rodriguez, Jason Wu launched his namesake line in 2006 and experienced a shot to stardom unlike any other. His aesthetic is elegant yet fuss-free. Wu’s pieces have clean, classic lines and pay homage to a timeless glamour. The garments are simply beautiful, always noteworthy. That much was clear upon touching my first Jason Wu dress. The construction? Impeccable. The fabric? Lust-worthy. At $4,500 a pop? Unattainable. Last fall, however, whispers began in the fashion industry of a possible mass-market collaboration in the works. In October of 2011, Target announced a partnership with Wu to introduce an affordable, limited-edition collection of women’s apparel, handbags, and scarves, set to launch in February of 2012. I was excited, to say the least, and a leaked Jason Wu for Target sketch posted online a mere twelve hours after the announcement only fueled my near-border hysteria. The question on everyone’s mind, however, was whether Wu, whose designs are predicated on luxurious fabrics, precise cuts, and exquisite tailoring, could translate the essence of his style to such a moderately priced line. Would the line mirror his collections past? This past September, Wu pushed his boundaries, producing what he called an “edgier” collection. And edgier indeed as nylon outerwear and color-injected, pattern-filled looks walked down the runway. In December, regal was all the rage, where hand embroidered evening dresses, including a stunning strapless black gazar with green beading, sashayed around the floor. Where would the Target collection fall in Wu’s repertoire? This past Sunday, the Jason Wu for Target collection debuted in Target stores nationwide and on Target.com. The collection sold out in minutes. Wu fanatics were lining up at Target stores all across the country in the wee hours of Sunday morning to try to get their hands on a piece from the designer. Many had attempted to score items earlier online to no avail. The collection, as seen from the look book previews, was inspired by French New Wave films, and reflects, from Wu’s perspective, an American girl in Paris. Top sellers included the flared dress in both color ways, poplin dress, trench in both color ways, dotted sheer blouses, and accessories. The collection retailed from $19.99 to $59.99 for apparel and $19.99 to $49.99 for accessories. Stylistically, the collection remained on-point. I definitely saw the inspiration manifested in the designs, and Wu’s tendency towards femininity and sophistication were evident. After that, the collection fell a bit short of my expectation. At the store, shoppers in the dressing room constantly commented on how the collection ran large, and after skipping the dressing room lines and trying my purchases on at home, I have to wholeheartedly agree. Wu’s usual body-flattering tailoring seems to be lost through this collection as well. Most items have a boxy cut, with a straight-line silhouette. For petite members of Wu’s fan base, the collection simply will not work without minor, if not major, alterations. The fabric quality was sub-par but perhaps expected given the low price point. None of this seems to matter to most, however, as items are still selling above retail on eBay. In short, Target still has a hit on its hands. The Jason Wu for Target collection is another great example of the retailer bringing high fashion to the masses. The collection is performing up to expectations, and demand remains high. If Wu wasn’t a household name before this collection, he certainly is now. The industry darling’s career only continues to grow, and we are eagerly awaiting his next step. 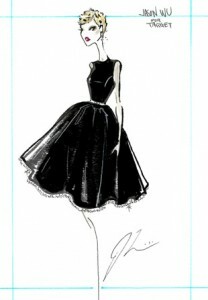 For more information and to view the entire Jason Wu for Target collection please visit www.target.com. For more information on Jason Wu please visit www.jasonwustudio.com.